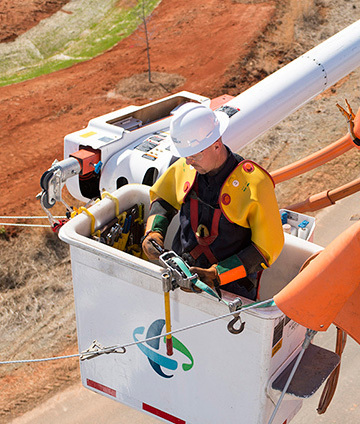 Manage dispersed personnel, respond faster to outages and reduce costs. Regroup Mass Notification is the ideal communication solution for utility companies who want to improve efficiency without incurring high costs. Regroup helps keep your mobile workforce on point with critical and non-critical notifications delivered to voice, text, SMS, email or even digital signage. Regroup’s exclusive QuickPost feature can quickly notify entire teams when outages occur. And, notifications can be sent to a selected geographic location for even faster response. With Regroup’s QuickConference feature, you can easily collaborate with any number of personnel, enabling you to assess and act more effectively. The Regroup platform is easy to use and intuitive. Trusted by universities, health care institutions, government and enterprise, Regroup allows you to more effectively reach your mobile workforce, no matter where they are. Regroup helps utility companies stay ahead of customer dissatisfaction by greatly reducing response times when outages occur. Utility companies can also reduce costs by using a multimodal platform that delivers to virtually any device through a robust cloud-based solution. You can learn more about Regroup Mass Notification by contacting a representative here or schedule a personalized demo. 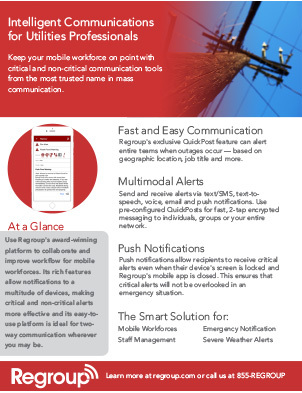 Regroup for Utilities – our quick sheet shows why a mass notification system is an essential tool for utility companies and energy providers.